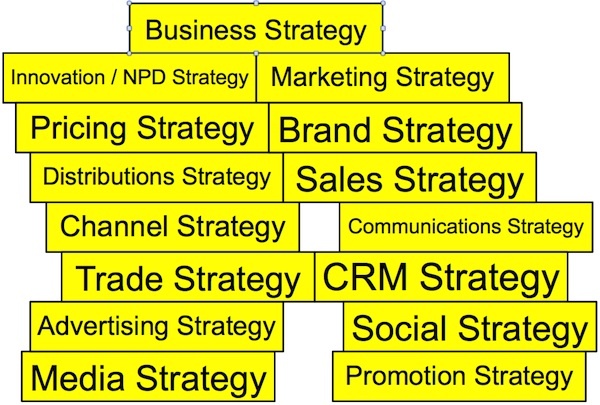 The term strategy is used a lot in marketing and especially in agencies. There is nothing wrong with the word, it is more the application of the word that can be problematic to clearly articulating what is meant, required or expected. The issue is that there are many different types of strategy: business, marketing, channel, advertising, pr, channel, media etc etc etc. This problem especially arises when a marketer is talking about the ability of their agencies to develop and deliver strategy. Often the perceived strategic failure of the agency is because the type of strategy the client requires is not a core skill of the agency. Where the marketer wants marketing strategy, including pricing and distribution, often the agency provide communications strategy as this is the core competency. But the differences between these is rarely defined. My friend, Shawn Callahan at Anecdote, recently recommended the book “Good Strategy/Bad Strategy: The Difference and Why it Matters” by Richard Rumelt. Shawn tells me that the book defines a strategy as a solution. On this basis an excellent rule of thumb to work out what type of strategy you need is to define the category of problem you have. eg. If you have a pricing problem you need a pricing solution so you need a pricing strategy. If you have a media problem you need a media solution so you need a media strategy. But what if you do not know what type of problem you have?